In early 2008, I reviewed Screen Flow 1.0.2 ( ), one of the first “screen movie studio” applications for the Mac. At the time, I found the program a solid first effort with some room for improvement. The recent release of Telestream’s ScreenFlow 2 addresses many of my earlier complaints, and offers some additional features that users who record screen movies will find useful. I tested ScreenFlow 2 on a variety of machines, including a 2.66GHz quad core Mac Pro running OS 10.5.8, a 2.6GHz MacBook Pro running 10.6.1, and even on my OS X-enabled Dell mini (running 10.5.8). On all three of these machines, performance was excellent. I was able to capture audio and video in each application I tested, including RealPlayer, which caused problems for Camtasia for Mac ( ). Users familiar with ScreenFlow 1.x will immediately feel comfortable in ScreenFlow 2.0—there are no dramatic interface changes. Instead, there are subtle differences in familiar tools, as well as some entirely new features. Of these new features, the ability to add transitions to your screen recordings is one of the most welcomed. In the previous version of ScreenFlow, you couldn’t (for instance) fade out one piece of a video while fading in the next, or show any sort of transition between the two clips other than a black screen. In ScreenFlow 2, you can choose from 16 different 2D and 3D transitions, each of which can be applied as a starting or ending transition to a given clip or text box. In addition, if you align two clips such that they overlap on the timeline, a transition will automatically be inserted—ScreenFlow’s preferences are used to set the default transition, and the amount of overlap you create when dragging determines how long the transition will take. The 16 2D and 3D transitions in ScreenFlow 2. Adding transitions manually is a simple two-step process. First, Control-click on a clip and use the contextual menu to add a starting or ending transition. Second, Control-click on the newly-inserted transition and change the type using the contextual menu, or open the Transition Inspector to see all the transitions in a pop-up window, complete with examples of how each behaves. To set the duration of each transition, you drag the small vertical bar that divides the transition area from the rest of the clip (as seen in the text clip at the bottom of the image at right); there’s no way to set precise timing by entering a duration in a box, for example. The transitions are generally well done, and go a long way to making ScreenFlow 2 an all-in-one solution—titles and clips can appear and disappear using transitions of your choice, and the automatic transition insertion when you overlap two clips is a nice timesaver. ScreenFlow 2 has a new acceleration curve feature that lets you control how actions that affect scaling, rotation, position, and volume are implemented. By default, ScreenFlow 2 uses an acceleration curve that’s linear (not a curve at all)—that is, effects are applied equally over the timeframe during which they’re active. For motion and scaling actions, though, the linear curve may lead to changes that seem very abrupt to the viewer. Acceleration curves control how certain actions accelerate and stop. Four additional acceleration curves in Screen Flow 2 eliminate this problem; choose from ease in (starts slow then speeds up), ease out (starts fast then slows down), ease in and out (slow at the start and finish, faster in the middle) and none (action happens immediately, in one frame), based on your preferences. I’ve found that I like the ease in and out curve, which provides a nice transition to and from the recording surrounding the action. ScreenFlow 2 now allows you to create a freeze frame in your video. Freeze frames are a great way to draw a viewer’s attention to something onscreen, or to extend your movie to cover an overrun in your voiceover recording (or so I’ve been told), and they’re really easy to create in ScreenFlow 2. When you insert a freeze frame, ScreenFlow 2 splits your clip, adds a two-second still of the image at the current playhead position, and moves your remaining video to the right on the timeline by two seconds. You can then manually adjust the timing, effects, and transitions on the freeze frame. 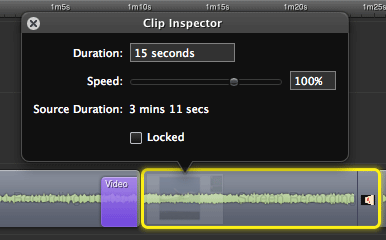 The clip inspector lets you easily change clip playback speed. A new Clip Inspector, available via the contextual menu in any clip, lets you easily change the speed of each clip—by simply dragging a slider, you can dramatically speed up or slow down a clip. Because you’ll usually be changing the speed of a segment of a longer recording, you’ll first want to split the clip in two places, leaving just the snippet of video whose speed you’d like to change. While testing the speed changing feature, I ran into a ScreenFlow limitation. Once you’ve split a clip—either to change its speed, or perhaps to delete some unwanted video—there’s no way to merge those split clips back into one (other than undoing your actions). So if want to, say, apply a callout to focus on the cursor, you’ll need to apply it twice if the cursor’s motion happens to span the split in your clip. It’d be great if you could just select two clips and use a merge function to turn them into a single clip again. ScreenFlow 2 includes some basic video adjustment tools, too—you can change the saturation, brightness, and contrast of any clip in your production. Because these effects can be applied as video actions, it’s very easy to, for example, fade a recording to grayscale over time, and then restore the color at some future point in your recording. While it’s nothing close to a full set of color correction tools, given ScreenFlow’s focus on desktop recording, this limitation shouldn’t affect many users. When you’re done with your project, you can upload it to YouTube directly from ScreenFlow; just select File -> Publish to YouTube, enter your YouTube user information, and fill in values for Category, Title, Description, Tags, and ScreenFlow will do the rest. You can also mark your movie as personal, and publish it in HD if you wish. If you’re going to use the HD option, make sure your original movie is at an HD aspect ratio. As a test, I took a very square movie (definitely not HD aspect ratio) and uploaded it as an HD clip. The end result was a square movie that had been stretched to fill the HD screen’s letterbox resolution—in other words, it wasn’t a very pretty sight. The time required to upload to YouTube will depend on the length of your video, the CPU power in your Mac, and the speed of your internet connection. Using a two-minute demo movie cropped to roughly a 1020 by 1020 pixel square, it took about four minutes for my clip to be converted and uploaded to YouTube (on a 5mbps upstream connection). Once uploaded, YouTube does additional processing that takes a few more minutes. For those not interested in YouTube, ScreenFlow 2 includes the same fully-customizable export abilities that were found in the first version of ScreenFlow. Audio ducking and effects bring more power to the audio side of ScreenFlow. Ducking is the process of lowering the volume on background tracks to make the foreground track easier to hear. In ScreenFlow 2, ducking is enabled (on the foreground track) with a simple checkbox and a slider to set the volume percentage for background tracks, and you can use different ducking settings for different clips. Enhance audio with sound effects. You can also add a range of sound effects to your audio clips, and split audio out from the source screen recording. 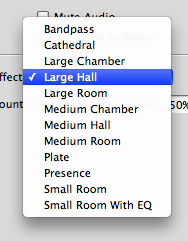 Checkboxes allow easy remixing to mono and muting of audio output. You won’t find as fine-grained control over audio levels as you get in Final Cut Express, or even to some extent iMovie, but the audio features present in ScreenFlow 2 will probably be sufficient for most users. I also used ScreenFlow 2 to record an audio overlay track, and it worked perfectly—a menu item allows you to easily add additional recordings to your project. These overlay recordings aren’t limited to audio, though; you can just as easily create another screen recording and add it to your project. There are a host of minor improvements in ScreenFlow 2, including many more keyboard shortcuts; live audio scrubbing (as in iMovie), which can be disabled if you prefer; improved markers, which can be used to speed editing (to jump to spots in your project), and can be exported as a chapter track during QuickTime export—this will allow your viewers to navigate your presentation by chapter; clip adjustments (scaling, rotation, reflection) can be copied and pasted between clips; and finally, clips themselves can be copied and pasted (or dragged and dropped) between ScreenFlow projects. In the program’s preferences, you can specify whether ScreenFlow should interpolate pixels when zooming, which provides a smooth look, or just make the existing pixels larger, leading to a sharper-but-blockier video. You can also choose to use lossless recording compression, which you should only do if you intend to export from ScreenFlow using the Apple Lossless codec (to use in Final Cut, for example); the default adaptive compression works best for all other export formats. Lossless recording (left) shows fewer artifacts than adaptive (right), but leads to larger file sizes (click to see a larger image). I ran a quick test with lossless recording, and there’s a definite (but small) difference in recording quality. The difference only really comes out when you can zoom in on an area of the screen; click the image at right for a much larger version that makes the differences more apparent. However, unless you need this extra quality, you’ll be better off with adaptive recording, which results in smaller file sizes while retaining very high image quality. One final change in ScreenFlow 2 is that your project files are saved as one bundle in the Finder, making it much easier to move the project from machine to machine. Click to watch a demo of ScreenFlow 2 features. As I was working on this review, I unintentionally wound up with something of a “demo reel” showing many of ScreenFlow 2.0’s new features. This video is a reasonable demonstration of what’s possible with ScreenFlow, so I went back and added a voiceover track, explaining the various features being used. The video itself was taken in X-Plane, showing an approach and landing at Portland International in relatively typical winter weather—lots of clouds, basically. If you’d like to watch the video, just click the image. Unlike Camtasia for Mac, there are no built-in shapes in ScreenFlow that you can use to highlight items onscreen. You can import transparent PNG images, though, and use those as callouts. Still, it’d be nice if there were a library of objects—customizable for size, color, background, opacity, etc.—that could be used to attract attention to parts of the video. Similarly, I’d love a way to arbitrarily zoom a portion of the screen without zooming the entire screen. You can do this for the frontmost window, or for a region under the mouse, but not for an arbitrary portion of the screen. If you plan well in advance, you can position the mouse to work around this limitation, but an arbitrary region zoom tool would add flexibility to the editing process. Finally, while the text box features work quite well—especially with transitions—there were times when I wanted to add titles to my screen recordings, such as you can do in iMovie and Final Cut. Titles are more than just a text box; they’re text boxes with predefined styles, locations, and (most importantly) built-in animation effects. While a text box with well-chosen transition can simulate an actual title, it’d be nice to have a tool that provides for a selection of titles, including some with animation. ScreenFlow 2.0 is a big step forward for the screen recording application. The addition of transitions, freeze frames, clip speed adjustments, audio ducking, and basic color adjustment tools really make ScreenFlow an all-in-one solution. It’s now something that I could use for an entire project from start to finish, instead of exporting my edited screen recordings for further processing in Final Cut Express. Those users who need higher-end features, such as real color correction or advanced titling and more control over transitions, will still want to do some work in Final Cut or Final Cut Express; for most anyone else, though, ScreenFlow should meet their needs. Compared to Camtasia for Mac, its most direct competitor, ScreenFlow holds the edge in a few key areas. ScreenFlow does a better job at capturing high CPU usage activities, it will let you record on a second or third monitor (though only one screen at a time), and its tools for focusing attention on windows, and activities around the cursor, are better than those in Camtasia. For now, at least, ScreenFlow’s combination of tools and performance makes it the best all-in-one screen recording and editing tool for the Mac.